I finished Tic Tac Meow. Thank you for all the suggestions about cat placement. Clearly, I have not been around cats enough. Apparently, some of the X blocks would have been scattered or askew if they had truly been around a cat. I really didn't feel like ripping and rearranging though, so things are rather more orderly than a true cat would have allowed, but here it is. I didn't want any quilting on the Cuddle fabric. I wanted an uninterrupted soft furry surface for the cat, but that would have left too large an unquilted space under the cat. 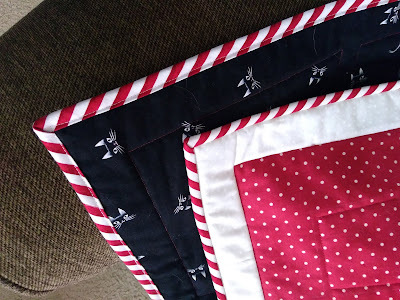 (I used Hobbs Heirloom 80/20 blend batting and it specifies quilting no more than 4 inches apart.) To get the effect I wanted I quilted the quilt before adding the cat, and just stitched though all the layers to sew the cat on afterwards. I hope that survives multiple washings! I couldn't resist the striped binding. I'm glad I had blogged about joining diagonal stripes on the bias when making striped binding, because I couldn't remember how to cut the strips to hide the seams where strips join. I'm glad I didn't have to waste any fabric to figure it out again. I just love this red stripe and am trying to make it last! I found the perfect backing too. Look at those little whiskered cat faces! I almost hate to let it go, but this quilt will be on its way to its new home soon. I'll still have a little bit of it though. I cut out more squares than I needed for the quilt so that I could audition the fabric and fabric positions. I also had waste triangles from the stitch-and-flip corners. 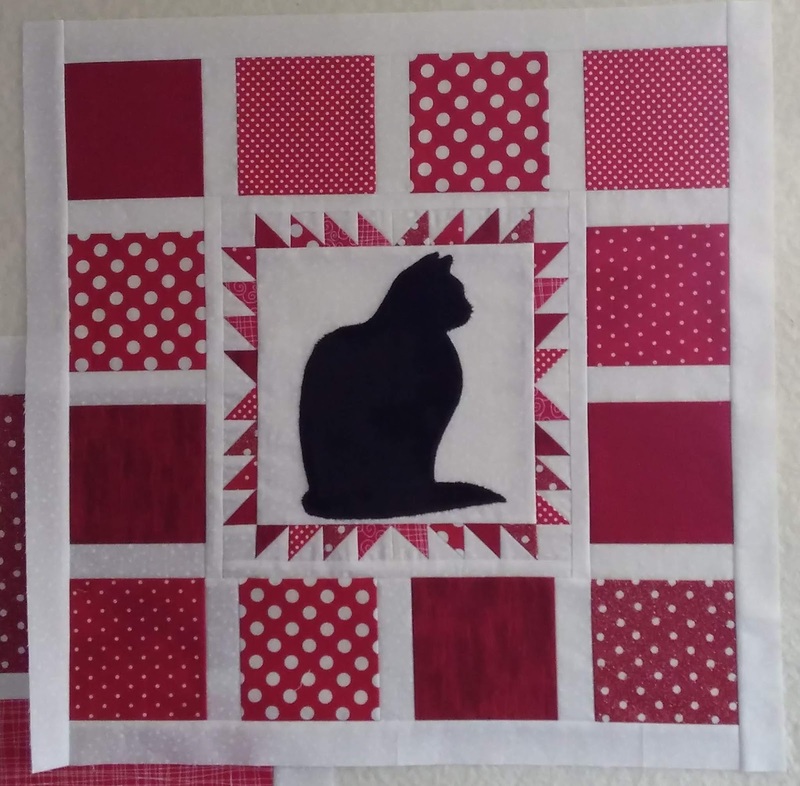 Finally, I had an extra cat silhouette, cut out to fit in one block before I decided I wanted the cat to have more presence. The leftovers all fit quite nicely into this little piece.. 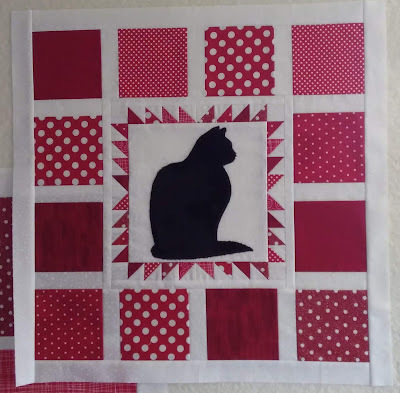 I have decided it will be the center of my round-robin quilt at guild so I'm naming the cat Robin . We will pass our centers along for the first round of borders in a couple of weeks then it will be several months before I see how the quilt turns out. I have lots of ideas for borders but the fun will be to see what my group partners will come up with instead. I'm rather impatient to see, and we haven't even started yet. I think I'm going to have to develop a little bit of patience! The quilt came out beautifully and I'm sure it will be loved. The blocks may be too orderly to have been assembled by a cat, but I've found my cats are more than happy to lounge on the finished, layout chosen by a human, versions...just as it seems the one in your quilt is doing. And the little center quilt of leftovers is perfect. I'm excited, too, to sew how it comes out. So I guess that makes two of us that need to learn patience! It turned out fabulous. I love the stripe binding. It is great that you already have the leftovers used up. I am never sure what to do with mine. The quilt is cute, especially with the striped binding. But I have to admit, the round robin center is my favorite! I'll love to see how it comes out! Hi Joanne, what a lovely quilt. It really came out great! I think the finish is delightful. And the striped binding is a very fun edge to the whole thing. What a good use of leftovers. I look forward to seeing what others add to it. 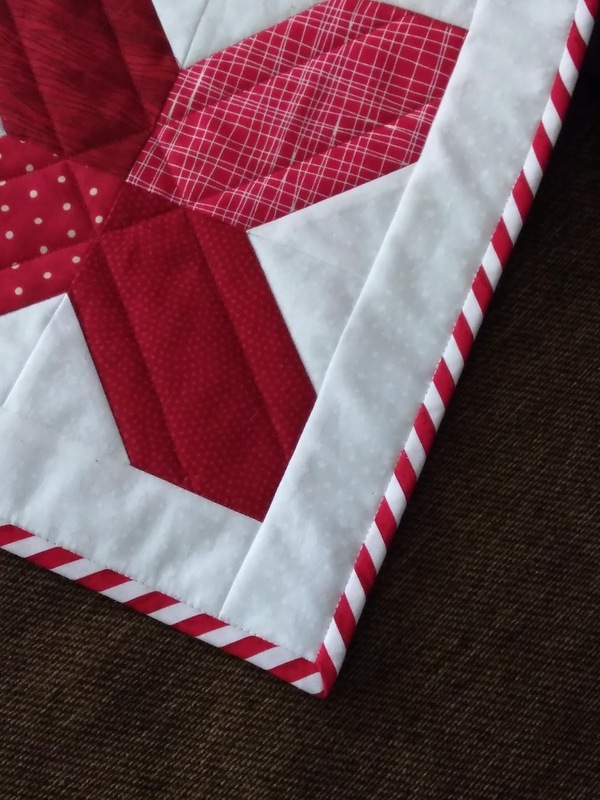 Your first quilt shown is very pretty, and I love the striped binding. 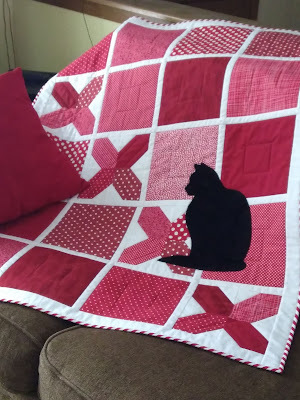 In this particular quilt, you could say you are tempting the cat to play with the 'strings'. Then to make another quilt that turned out so special, and from the leftovers? That seldom happens for me! I'd hate to let either one of them go! ---"Love"
Your quilts are so cute! Both are wonderful and I love the kitty backing fabric and the red and white binding. All combined to make a pretty quilt. The little quilt is adorable, too. You have such wonderful designs. What is your favourite LQS?